Prudential plc recently announced its 2014 results so I thought I’d take another look at this popular and relatively defensive financial services company. 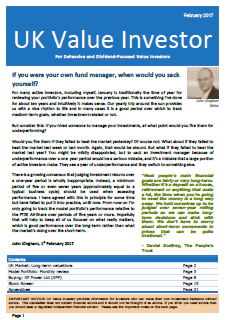 I wrote about some of Prudential’s more recent history, both good and bad, in an article for the BullBearings website last summer. In that article I thought Prudential’s shares, at 1,400p (June 2014), were probably close to fair value. In turn I thought that outperformance over the next few years would be no more likely than by chance alone. Now that Prudential has published its latest results the picture has changed and my previous assessment needs to be revisited. For 2014 the run of success which has characterised the company’s performance in recent years continued. Net asset value was up over 20%, basic earnings were up over 50% (from a weak 2013) and the dividend grew by 10%, on a per share basis. 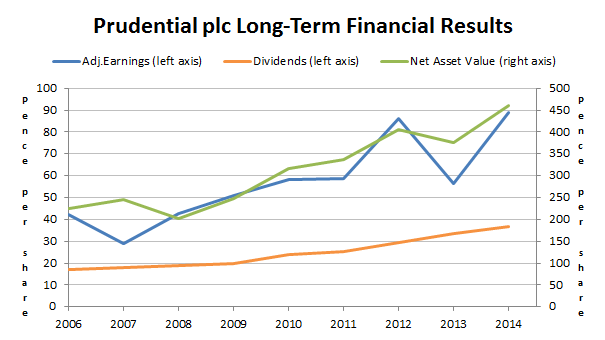 So in terms of results Prudential is clearly an above average company in that it has produced market-beating progressive dividend growth, supported by equally rapid growth in earnings and net asset value. Life insurance balance sheets can be a bit of a nightmare to analyse for risks, or at least they are for me. After much spreadsheet-bashing I have found a reasonable correlation between a company’s ability to maintain its dividend in tough times (such as the financial crisis) and the amount by which it exceeds its minimum regulatory capital. If you don’t know what “minimum regulatory capital” means, it’s to do with the strength of the company’s balance sheet. In simple terms an insurance company’s balance sheet shows its assets (saved and invested premiums that will be used to cover future insurance claims) and its liabilities (expected future claims). Regulatory capital is effectively the surplus of assets over liabilities, i.e. the company’s ability to pay those expected future claims, plus a few other things like “subordinated” debt. Most insurance companies listed in the UK have to exceed certain minimum capital requirements, defined under either the EU’s Insurance Groups Directive (IGD – for insurance companies) or Financial Groups Directive (FGD – for financial conglomerates, e.g. companies that combine insurance and banking). In my opinion only slightly exceeding the minimum regulatory capital is not enough. History shows that insurance companies with only slightly more capital than the required minimum may meet their legal obligations, but they often have to cut their dividends or carry out rights issues to strengthen their capital positions when things get tough. Both of those unpleasant actions were common after the dot-com bust and the financial crisis. However, some companies sailed through relatively unharmed. As a general rule of thumb I’ve found that the insurance companies which avoided dividend cuts in the financial crisis had at least twice their regulatory minimum capital. In Prudential’s latest annual results its actual IGD regulatory capital was 2.4 times its required minimum, so it meets that rule of thumb. It also has one of the most prudent balance sheets, by that measure, among the big insurers. When I last review Prudential in June last year its share price was 1,400p and I thought that was about fair value. Today its share price stands at 1,750p, which is 25% higher than before. Unless the company has improved its underlying results by more than 25%, or unless the rest of the stock market has become more expensive even faster, it’s not looking good for Prudential as a value investment. To some extent I would expect a highly successful company like Prudential to have a premium price, but if the price paid is too high then future returns may be stunted, regardless of how good the underlying company is. And that’s my concern in this case because Prudential trips up on a few of my other rules of thumb. 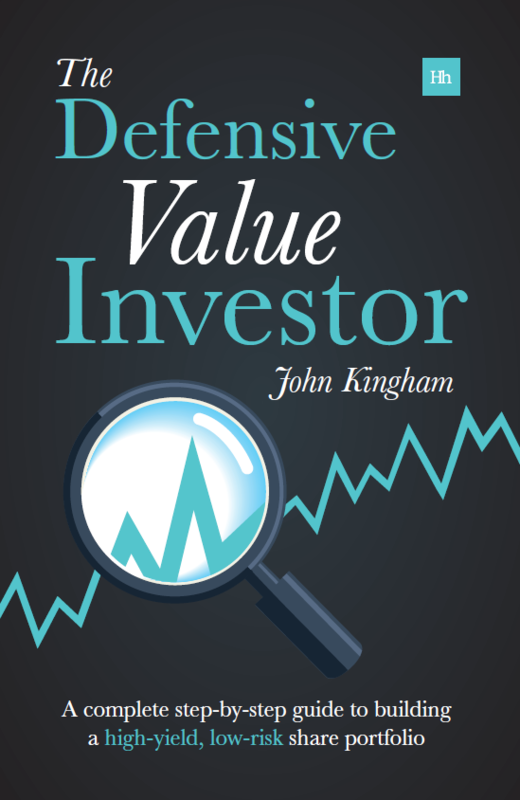 First of all I have six core metrics, three for quality or defensiveness (Growth Rate, Growth Quality and ROCE) and three for value (dividend yield, PE10 and PD10). Generally I like the companies that I invest in to beat the FTSE 100 on at least four of those metrics. So sometimes the companies I invest in will be high quality with a reasonable valuation, and sometimes they will be medium quality with a low valuation. Prudential beats the market on all of the quality/defensive metrics but none of the value metrics, so it is clearly a good company but the price just isn’t attractive (at least to me). Another rule of thumb I have is to never buy any company where the PE10 ratio is above 30 or the PD10 ratio is above 60. From experience I’ve learned that those are reasonable cut-offs, beyond which I may be overpaying, even for a great company. At its current share price Prudential breaks both of those valuation rules and so for me I would not invest at 1,750p, no matter how quickly it was growing. So if I wouldn’t buy at 1,750p, or even 1,400p, what price would I buy at? Given its current dividend and earnings history, Prudential would meet my rule of beating the market on at least one of my valuation metrics if its share price fell to 1,100p. At that price it would have a dividend yield of 3.4%, equal with that of the FTSE 100 at 7,000. It would also have a PE10 ratio of 19.3 and a PD10 ratio of 44.5, both of which are within acceptable limits as far as I’m concerned. For me that would be a much more attractive entry point. Do I think it will ever get that cheap? It’s seems unlikely unless the company runs into some problems, such as producing a year or two of zero growth. But while such a share price fall may be unlikely, it’s not impossible. I thought Rolls Royce would be attractive at 800p in July 2014, when its share price was 1,045p. By October that share price “target” was reached, although of course that does not make me an oracle. What it does mean is that even the best companies can trip up, fall out of favour and move from overpriced to underpriced in just a few months. It also means that patient value investors would do well to have a watchlist of target companies and target prices, so that they are ready to make the most of opportunities as they arise. As ever, great analysis John. I also would not be buying Pru at current prices/yield. I did however purchase at the height of the financial crisis in Nov 2008 for 250p. I would have been a wealthier man now had I bought a lot more than I did and also if I had held on longer – I foolishly sold some 3 or so yrs later for 3x what I paid thinking they probably would not go a lot higher! My current holding in the sector is L&G – current p/e around 17 and yielding 3.9%. Wow! 250p? That’s a pretty impressive price. Yes 2008/9 were pretty heady days for those who were brave enough to be buying rather than selling. I guess even if you’d have held them you would have rebalanced the position size otherwise it would swamp your whole portfolio, skewing diversification and risk to that one company? As for L&G, I think that looks like a good choice. It doesn’t rank on my screen to well because of the dividend cuts and losses in the financial crisis, but in reality I think it’s a decent holding. Thanks for the analysis. It is one that I own, bought in March 2010 at £5.20445, in the midst of the AIG debacle, when I thought whichever way it went, I would win. Now to time the exit. Your article has given me food for thought, but I’m not sure I’m ready to sell yet. May be being a little greedy, but I think there may be some more growth to come when they announce who the new CEO is, especially as they are consulting major shareholders, which unfortunately, I won’t count as, due to being a small self investor. It is always a problematical issue timing sales; I know you like to take emotion out of this and apply a straight forward approach, but Greggs gave me a salutary lesson when it had recovered last year and I sold out at £6.198385 for an annualised return of 18.25% (a good return to say the least! ), but look what has happened to the price since and what the gain would have been. Hi Gareth, I wouldn’t say that Prudential is a “sell”, because I don’t think it’s overvalued as such. I just don’t think it’s in the buy-zone. Remember there’s a wide range of prices at which any company is a hold. So hypothetically there is an attractiveness continuum between say 1,000p where Prudential is a strong buy, through to 2,000p where it might be a strong sell, and in between it goes through strong buy, weak buy, hold, weak sell, strong sell. I think it’s probably in the hold-zone at the moment while 1100p would be a strong buy. As for Greggs I think that stock’s volatility is a great example of the inefficiency of the market and how nobody really has a clue to the intrinsic value of most companies. In 2011 it climbed to 550p, in 2013 it fell below 400p and now it’s over 1,000p! I wouldn’t be surprised if it was back below 500p in a year or three if something goes wrong. And I wouldn’t even think about trying to “time” sales, as it’s impossible. I just sell when I think something isn’t good value any more. If the price triples after I sell then I don’t care in the same way that I don’t care that I didn’t pick the winning lottery numbers last week. For me Prudential is the best example on how an insurer could manipulate its earnings within the rules. Their CEO’s got a better job at Credit Swiss and I wonder if I should buy some Credit Swiss shares and probably I will. The main issue is that the assurance model is broken. In this model the fees are loaded upfront and as a result profits are booked upfront. So if Prudential sells you a 15 years savings plan in Indonesia, it pays 50% of the premiums for 24 months as commission to the selling agent/broker and 50% are booked as earnings for the insurer. About 40% of policies will lapse anyway within the two years period and Prudential gives the client nothing back. Similar with annuities, once one is sold 10-14% of the fund is booked as earnings and the rest are the actuarial technical provisions. Obviously in the de-risking process of Defined benefit pension schemes or what they name bulk annuities, the margin is lower, half of the above. Obviously a business model where lots of savings plans are sold and afterwards lapse could not last. You can only rip off a client once or twice, even if he is based in Indonesia. They did it in the UK, under the with-profits endowment and front-end loaded pension sales and it ended. 95% of the personal pensions sold lapsed within the first 7 years. They can still get some benefits out of them, however the pension flexibility will give people access to their poorly managed pension funds with high charges, instead of giving them even poorer annuity rates under direct offering. If I regret something is that I did not invest in Friends Life. It was always coming high on free cash-flow and no new business written to worry about. I just do not know why I did not invest.